Based in Nigeria, Toyin coordinates the implementation of the Media for Oil Reform (MFOR) program in Nigeria and supports broad capacity development activities for media in Africa and NRGI’s priority and limited engagement countries. Prior to joining NRGI, Toyin worked with the Wole Soyinka Centre for Investigative Journalism in Lagos for more than six years as the program and research officer. 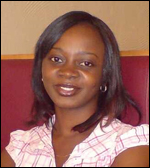 She was instrumental in the formation of an investigative journalism network in Nigeria. Toyin also worked with the civil society arm of Nigeria’s Economic and Financial Crimes Commission, where she researched corruption, conflict and development in Nigeria, and was a civil society forums facilitator. She holds an M.A. in peace and conflict studies and a B.A. in English, both from the University of Ibadan in Nigeria. In addition, she has certificates in journalism, communication for development, e-facilitation and project management. Toyin is passionate about social justice.